Last week, Jacinta and spent the day foraging for dried deciduous leaves in Blackheath (in the Upper Blue Mountains). Autumn has been a very warm (or non-existent) and leaves are only now starting to fall down in spades. Their colours are wonderful: Japanese maples, red oaks, liquidambars with their shades of bright red, beech and chestnut leaves and their golden yellows, white oaks, maples and plane trees and their different shades of brown. It is a true feast for the eyes. Walking around in the Blue Mountains in Autumn, one cannot help but notice the abundance of deciduous leaves falling in parks and gardens, but also onto bare asphalt on footpaths and streets. One minute they are there, and the next, they have been swept up by council trucks and transported to who knows where. If you look around, you will find the odd forager, with her/his bags or buckets and rakes, sweeping the precious leaves off the asphalt into their containers and making excellent use of them in their gardens by adding them to their composts. This is what we were up to a few days ago. After all, dried leaves are a wonderful high carbon input for your compost. They are alive and teeming with beneficial microbes and, most importantly, completely free! There is, however, a leaf foraging etiquette. It’s important, if you see a fellow forager, to go and have a chat and make sure you are sharing the bounty in an equitable way. Seasoned leaf foragers know how important dried leaves are to gardens and parks, and do not forage in them. Instead, they choose asphalt surfaces in quiet streets, which have less or no petrol contamination. They also tend to rake any residuous leaves back into nearby verge gardens or parks, and leave the space tidy. As a student training in soil microbiology, I can safely say that removing leaves from parks and gardens is a bit of a waste of energy and time. Leave them be, they are an essential part of maintaining soil healthy and alive with beneficial bacteria and fungi. Nature is doing all of the work for you by dropping leaves, which will act as mulch and then decompose into garden goodness. Leaf litter is the largest source of organic matter that enters mainstream ecosystems as it slowly turns into humus. It feeds a huge variety of beneficial organisms from microscopic ones to larger arthropods and earthworms. If you wanted, you could speed up the process of decomposition by going over them with your lawn mower, but, really, ‘leaf’ them be (pun intended). It has now been proven that old growth forests are by far the most productive ecosystems in the world, and the highest recorded rates of decomposition occur in cool temperate climates, in the winter, under the snow. Surprised? Well yes, it is surprising but true. This is largely due to autumn leaves, which provide insulation as well as a rich food source for decomposers. Dried leaves are very rich in cellulose and lignin, which is predominantly decomposed by fungi. Fungi are (among many other things) responsible for the production of glomalin, the sticky glue that gives good soil its excellent structure and ability to retain water. Many people know about the importance of bacteria in soil, but few people know that you need bacteria and fungi in equal parts to be growing annual vegetables. If you have more bacteria than fungi in you soil, you will be growing early successional grassy weeds as that is the environment they favour. Most vegetable prefer mid-successional soils with equal amounts of bacteria and fungi. So how do you make sure you have enough beneficial fungi in your soil? Become a leaf forager, rescue leaves from the streets and add an abundance of leaf litter and woody materials to your compost. A quick note on eucalyptus leaves and pine needles: they contain anti-bacterial oils, so it is best to let them sit for a little while before using them. After these oil have leached out, use them in your compost! If they are fresh, you can still use them, but in moderation. As a budding leaf forager, identifying different trees and their leaves is helpful. As with everything, the more variety in your leaf litter, the more variety of microorganisms you will have in your compost and soil. I have found http://www.tree-guide.com to be an awesome resource, and I am currently working on a poster to help you identify different leaves. In the Blue Mountains, you will find an abundance of liquidambars, white and red oaks, and japanese maples. These are all fantastic foraging leaves. So, get out there and become a leaf forager! Freshly made compost in Lyttleton Gardens using foraged leaves. Foraged leaves in onion bags next to Toby the Lyttleton compost tumbler. One part scraps from the shop, three parts dried leaves! I never tire of marveling at the incredible diversity of climates and ecosystems here in the Blue Mountains. It is an incredible asset, as it means we can grow a diversity of foods within a relatively small area. Our backyard growers from the lower Mountains will be bringing us ginger and turmeric soon, mid-Mountains growers are providing us with citrus, whereas upper Mountains growers will be keeping us stocked with apples throughout autumn. Our local farmers, including Erica and Hayden at Epicurean Harvest in Hartley and Aaron at Harvest Farms in Bilpin, also supply us with wonderful, nutrient-rich, organic local produce. What a wonderful, resilient space we have the potential to create, just through cultivating this diversity of growers, scales and climates! Our 'Lyttleton Backyard Grower' system allows local backyard growers register with us, bring in their excess produce and swap its cost price for store credit. This allows growers to buy anything they may require within the shop, be it a loaf of bread, some veggies or a workshop. I organise regular meet ups every couple of months, where backyard growers can get together and discuss their successes and turbulations, share seeds, knowledge and experiences. The financial, environmental and social benefits of growing and eating local organic food are quite substantial, namely through eliminating food miles and providing individuals with a greater sense of responsibility towards their immediate environment. We must, however, also see its value in building social relationships. Our 'office cubicle' way of living is making us lonely, depressed, and anxious, and people in our peri-urban environments are slowly reacting to this. Things are slowly changing. Social media groups have re-established local swap and barter systems through Facebook groups such as 'Pay it Forward', and some of us are keen to take this concept back to our streets and local spaces. I see this at Springwood Community Garden, as older members, who walk up the hill from the local aged care facility, bump into young mums and/or dads, who feel they need to be out and about. The inter-generational relationships I have seen come out of a simple communal garden space are immense and important. We have forgotten how important inter-generational contact is for our own well-being. 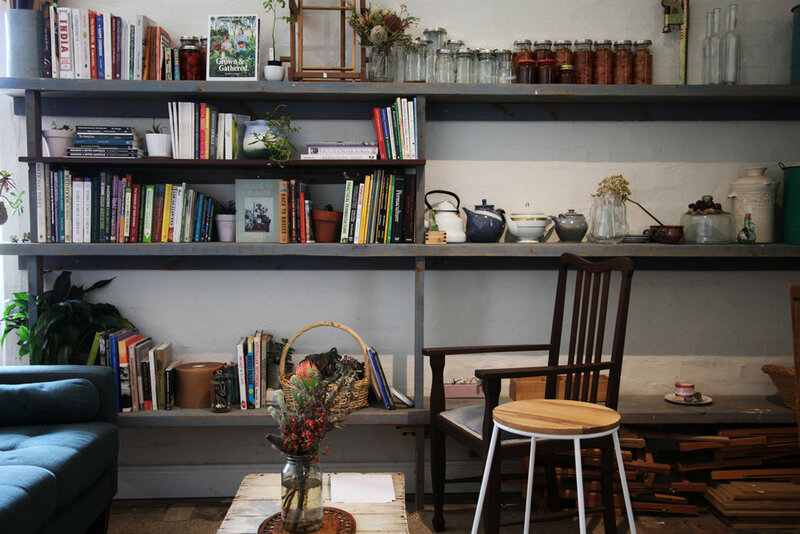 In our little veggie patch and shop, we are striving to empower people to grow their own food, come to our meet ups and exchange knowledge and experiences. 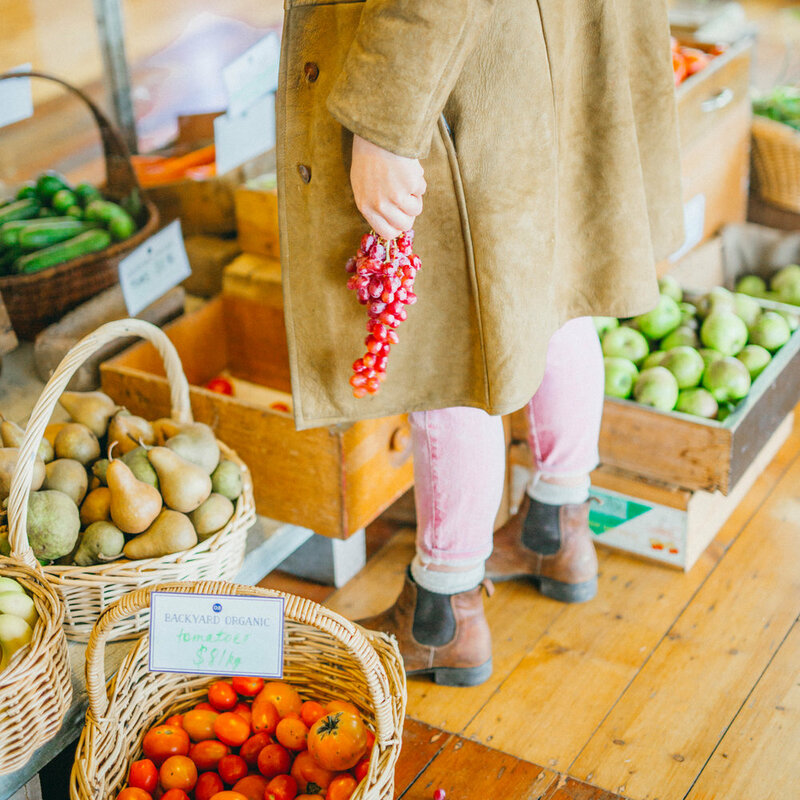 We do our best to entice you to come to your local produce shop rather than shop in a supermarket. So come and visit, make connections, hang out in our community hub, read from our reference library, have a chat, and, of course, eat yummy, local food together. I was visiting Canberra recently and driving through the suburbs had the wonderful surprise of passing rows and rows of pavement and front lawn and gardens bright with the orange glow of the Californian Poppy. It was a beautiful sight to see so many happily at home in people’s gardens. The Californian Poppy is part of the Papaveraceae family and used in Herbal Medicine. Unlike it’s opiate fellows, Californian poppies contain non-narcotic opium alkaloids amongst it’s medicinal constituents. An insight into the Californian Poppy’s therapeutic nature is seen in watching the way they move with the wind. It is as if the flowers absorb the impact of the breeze and channel it into a smooth, consistent, buffered, calm sway. Californian Poppy when used medicinally is calming. It is a calming sedative and an anodyne, relieving pain. Californian Poppy’s pain relieving actions assist many types of pain especially neuralgia, period pain, tooth ache, and pain from trauma, accident and injury. It is especially suited to pain where there is clenching, upset and agitation, and for pain that causes difficulty sleeping. Californian Poppy is used for insomnia and sleep troubles, it’s calming and relaxing action supporting the let go needed for easing into a restful sleep. Californian Poppy is indicated especially where sleep trouble is caused by over stimulation or nightmares. Californian Poppy is used particularly when there is agitation in it’s many forms and faces , like hyperactivity and agitation with pain. Californian Poppy is helpful where there is fixed and unyielding mental perspectives, helping the person to make shifts and changes from a calm and centred point, relieved of agitation with space for new thoughts and ideas to emerge. Californian Poppy is bitter and cool in quality. Like we see with it’s action in the wind, Californian Poppy buffers stimulation and aggravation, streaming it into a calm and collected response.